Most experimenters are familiar with "perf board" which is pre-drilled circuit board material. The components are mounted by inserting the leads through the most appropriate holes then are wired on the back side, usually by bending the leads over to the desired connection point. The finished product is mechanically great and attractive. I like the "electronic" look (and smell) of brown phenolic board but the green fiberglass board is actually superior. A somewhat more attractive technique (from one side, anyway) employs countertop laminate which can withstand soldering temperatures without burning too badly. A drill template printed on a piece of paper is taped to the laminate on the top, attractive side. A sharp, preferably carbide, bit is used to drill the holes for the components using the template as a guide. For those of us in too much of a hurry to make a template, the holes can be marked with a fine-tipped felt pen by eye. Parts with stiff legs can be inked on a stamp pad and pressed on the laminate to leave a drilling "footprint". 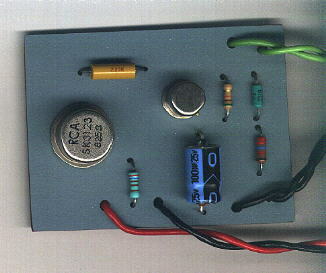 The picture below shows a siren circuit (found in an old GE hobby book) built on a piece of "Bermuda" blue laminate. The transistor legs were marked using the "rubber stamp" approach and the other components were marked by laying a piece of perf board on top and making little dots through the desired holes with a mechanical pencil. The holes are drilled from the top side for best results. Clamp a piece of wood to the drill press table so that the back of the laminate is supported to prevent chipping. No effort was made to make the back side attractive (no kidding!) but the back doesn't show in most cases. Two pieces of laminate may be glued together back-to-back if the appearance of both sides is an issue. The number of available colors is overwhelming and the hobbyist can really use his imagination here. Try to acquire one of those sample chains with all of the different available colors. (The printing usually comes off with alcohol.) Clean off the soldering flux with denatured alcohol followed by detergent and water. Make sure it is dry before you apply power! 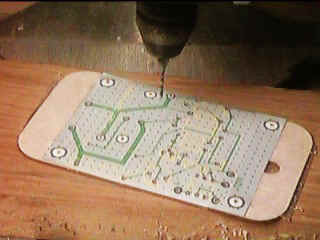 Some experimenters may have access to un-drilled phenolic or epoxy-fiberglass PCB material and either makes a great choice for this assembly technique. RF projects are best built on a ground plane and often need shields between stages so an alternative to the laminate is needed. My favorite technique uses tinned, double-sided circuit board material purchased from a PCB manufacturer. It can prove surprisingly difficult to explain what you want to the manufacturer since they usually don't understand how un-drilled, tinned PCB can be of any use. "But you won't be able to etch it if it is tinned" is the most common warning. Once they understand that you really don't want etching or drilling the price is usually pretty low. Get thin board (perhaps 0.031") so that it is easy to cut. Cut one piece for the ground plane and little pieces for connection "islands". I like to use an ordinary nibbling tool to make the islands. In this case, the "nibbles" are the part you want. The islands are soldered in place by applying a little solder along one edge. The molten solder will wick underneath and the pad will be secure. There is no need to reflow the entire pad. Note the long strip of PCB material at the top of the picture used to distribute power. (Don't forget bypass capacitors!) The clock oscillator legs are bent and soldered to the little connection islands except for the ground leg which is bent a little lower so that it is flush with the ground plane. 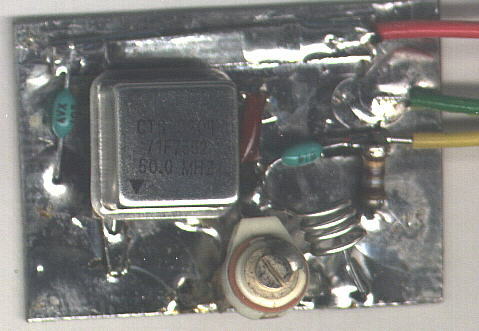 Note the surface-mount resistor soldered from the ground plane to the output island. Other surface mount parts can be accommodated in a similar manner. The tiny islands have very little capacitance to ground and the proximity of everything to the ground plane makes for a well-behaved circuit. And, since you are using double-sided board, you can have components on both sides for excellent circuit density. Drill holes wherever feedthrus are needed. 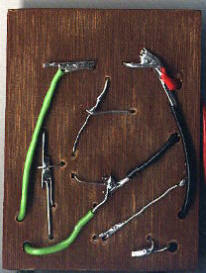 You can also use un-tinned copper board but soldering is more difficult and corrosion will spoil the looks eventually. Try polishing the un-tinned copper then spraying it with a thin clear protective coating. Soldering melts right through and you won't even notice it. The project above shows how many techniques may be mixed when a quick result is desired. 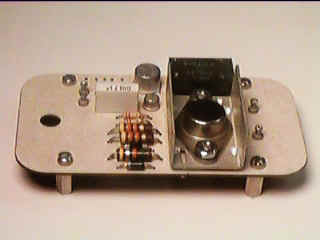 This gadget is a WWVB receiver that amplifies the 60kHz signal, mixes it with 50kHz derived from an external 10 MHz standard, amplifies the 10kHz difference frequency with a tuned audio transformer, chops that frequency with 10kHz also derived from the local standard then finally amplifies the resultant DC with a high gain op-amp circuit! The two-step down-conversion process avoids generating any 60kHz signals that would interfere with the receiver. The DC represents the phase difference between the local standard and WWVB and may be used to adjust the local standard to precisely 10 MHz. The signal comes in the top right corner where tuned circuits are mounted using the little PCB islands described above. Not all parts have their own pads and many component-to-component connections are used. 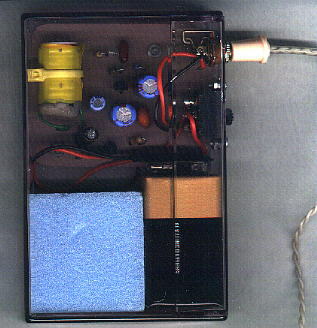 A "dead bug" style amplifier made from an op-amp mounted on its back is directly below. Mounting an IC on its back with the ground leg or legs bend back around to the ground plane is a really quick way to build a circuit; the legs make perfect little terminals for the wiring. The dividier ICs near the bottom middle of the circuit are also on their backs with solid "telephone" wire making the connections. The audio transformer is hot-melt glued to the board. The only "official" terminal is brown standoff in the bottom-left corner for the 10 MHz reference input. This isn't a pretty assembly but it is quite rugged and fairly easy to work on, an excellent combination when experimenting. The board is a solid plank normally used for hanging awards, medals, etc. 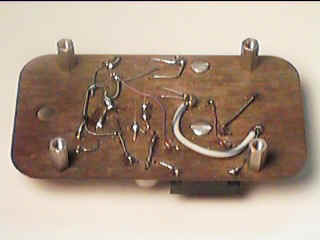 The connections are made to ordinary solder lugs fastened to the board with wood screws. The coil is wound on a cardboard tube coated with diluted epoxy (dilute with epoxy/lacquer thinner). Various brackets, knobs and other hardware where salvaged from old equipment. Other examples of wood substrates are here: Two-Transistor Radio, Simple Two-transistor Radio. These circuits are built on a sanded piece of oak with copper-plated steel nails for the connection nodes. Drill pilot holes for the nails or it will be extremely difficult to drive them! The nails are available in most hardware stores and are used for attaching weatherstrip. The circuit is a built into a 8 mm video cassette box which is fairly thick and just the perfect size for a 9 volt battery. (Forget about audio cassette boxes - they are too thin and ugly!) The box has a nice purple hue and notice that the circuit is built on a small piece of ""Wisteria" colored laminate. The yellow pickup coil is from a relay (note the color coordinated tie wrap). A piece of blue foam holds the battery in place and the finished unit really has a quality feel. Other projects in this library are built into various tin boxes which originally contained mints (Altoids) or candy. These tin boxes are great for RF projects because they are easily soldered. 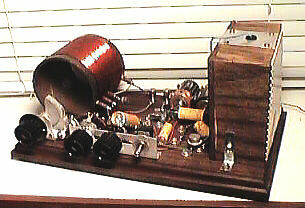 Looking around the shop I see a signal generator built into a homemade box made from pieces of tinned copper-clad circuit board soldered together along the edges, an experimental charge mill built into white PVC plumbing pipe, a lightning detector in a plastic peanut butter jar, an inline regulator in an ordinary plastic box with a snap closure, a receiver in a plastic electrical box from the local home improvement store, and all sorts of odds and ends on little pieces of wood and PCB material. If you are handy with wood, try making small boxes with recessed metal panels. A little stain and varnish really looks sharp. Only traces on the bottom of the board were allowed to make wiring easier and insulated wires were used wherever the traces were too close for comfort or carried significant current. The unused IC pattern is for an optional opto-isolator. If I decide that I want six of these puppies, I just click on "purchase" and they arrive 4 days later at a cost of about $10 each. That is a little high for just fooling around but it sure is tempting! With a little practice, layouts are quite fast. The component library is limited so create your own parts and save them in a component file (just another board file). The program opens and closes files very quickly so just open your component drawing to copy a part (ctrl-c) then re-open your design drawing and paste it in (ctrl-v). Make sure to say "yes" to "save changes" when opening the parts drawing! You should attach all of the pieces of your component together using the "group" command so that you can grab it all with one click.